Best Engineered BV models are superior electric hot power washers in its category. They offer a wide range of voltage (208V/230V/460V) and they are available in single or three phase. 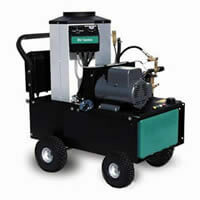 This series of powerwashers come with a wide range of accessories and attachments. The four-wheel cart offers great mobility and easy access to different cleaning areas. Hot power washers are excellent at jobs where significant amounts of oil and grease are present and/or when other heat reactive substances need to be removed. These machines offer split stainless steel outer coil wrap and can be upgraded with Auto Start and Time Delay Shutdown. In addition to its reliable Baldor motor and high-pressure pump, the BV Series is unique in that it comes with large fuel tank capacity, tube pneumatic tires, heavy duty gauge frame protection and easy access control box. Look for optional accessories like the pressure hose reel that mounts to the frame.